The Village of Pinecrest has added a 100% electric vehicle to it’s fleet of cars as part of it’s continuing efforts to go green. 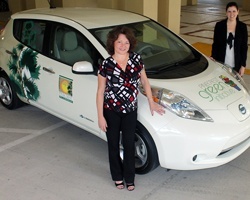 The car, a Nissan Leaf, will be used by the Pinecrest Building and Planning Department. The addition of the green auto is part of the continuing efforts of Pinecrest’s Green Initiative Program and was unveiled by Mayor Cindy Lerner and Village Manager Yocelyn Galiano Gomez last month. Meep meep! Florida Homeowners on Amendment 4 -What’s your Take? Perhaps you are not deeply involved with your local politics and that’s OK, I can understand that. A busy schedule and hectic work day don’t leave much time for anything else. If you’re like me just getting a solid 8 is a small miracle. Sometimes we need to make time for something even if we can’t and this is one of those times. If you are not familiar with Amendment 4 please allow me to sum it up for you. This amendment proposes to do 3 very important things for business owners as well as anyone buying their first home. Spoken by Maggie Dokic | Discussion: Comments Off on Florida Homeowners on Amendment 4 -What’s your Take? The Village of Pinecrest Community Center is hosting a Back-to-School Bash and you’re invited! The event is sponsored by the Village of Pinecrest and Family Magazine. The Pinecrest Back 2 School Bash will have many activities, including mini-workshops, demonstrations as well as the reveal of the Fall programming at the Community Center. So bring the kids to welcome the start of the new school year and have some fun. The Village of Pinecrest will be hosting Florida Licensing on Wheels (FLOW – how apropos) on Monday, July 25th, from 9:00 – 2:30. FLOW is a way for you to renew a Florida State driver license, get a replacement, submit a change of name or address, get an ID card, renew an auto registration or get a specialty plate without having to go to the usual DMV offices. If you want to meet the four finalists for the position of Pinecrest Village Manager, tonight’s the night. The four being considered for Peter Lombardi’s replacement will be at a reception this evening being held exactly for that purpose…so Pinecrest residents can meet them. With school almost finished in Pinecrest, it’s time to be thinking about summer vacation and how to spend it. Pinecrest Gardens has some great options for the kids. They have different summer camp programs available and they sound like lots of fun. They have a Summer of the Arts program which will have the kids exploring art in different techniques and materials. They also have a Midsummer Night’s Dream Intensive Dance camp for the dancer or wannabe dancer. You can get more information on schedules, registration and fees at the Pinecrest Gardens website.